Using NASA's Hubble Space Telescope, researchers have discovered that dark energy, a mysterious repulsive force that makes the universe expand at an ever-faster rate, is not new but rather has been present for most of the universe's 13-billion-year history. A team led by Adam Riess, a professor in the Henry A. Rowland Department of Physics and Astronomy at Johns Hopkins and a Space Telescope Institute researcher, found that dark energy was already accelerating the expansion of the universe at least as long as 9 billion years ago. This picture of dark energy would be consistent with Albert Einstein's prediction, nearly a century ago, that a repulsive form of gravity emanates from empty space. The team announced these findings in a media teleconference at NASA headquarters in Washington on Thursday, Nov. 6, and the findings will be published in the Feb. 10 issue of Astrophysical Journal. "Although dark energy accounts for more than 70 percent of the energy of the universe, we know very little about it, so each clue is precious," said Riess, who in 1998 led one of the first studies to reveal the presence of dark energy. "Our latest clue is that the stuff we call dark energy was present as long as 9 billion years ago, when it was starting to make its presence felt." Hubble's new evidence is important because it will help astrophysicists start ruling out competing explanations that predict that the strength of dark energy changes over time, Riess said. In addition, the researchers found that the exploding stars, or supernovae, used as markers to measure the expansion of space today look remarkably similar to those that exploded 9 billion years ago and are just now seen by Hubble. This is an important finding, researchers say, because it gives added credibility to the use of these supernovae as tools for tracking the cosmic expansion over most of the universe's lifetime. 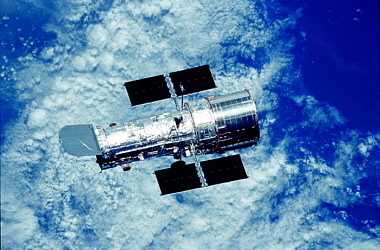 To study the behavior of dark energy long ago, Hubble had to peer far across the universe and back into time to detect ancient supernovae, which can be used to trace the universe's expansion and determine its expansion rate at various times. The method, Riess said, is analogous to watching fireflies on a summer night. Because all fireflies glow with about the same brightness, you can judge how they are distributed throughout the backyard by their comparative apparent faintness or brightness, which depends on their distance from you. Only Hubble can measure these supernovae because they are too distant, and therefore too faint, to be studied by the largest ground-based telescopes. Albert Einstein first conceived of the notion of a repulsive force in space in his attempt to explain the balance of the universe against the inward pull of its own gravity. If such an opposing force did not exist, he reasoned, gravity would ultimately cause the universe to implode. But Einstein eventually rejected his own so-called "cosmological constant" idea, and it remained a curious hypothesis until 1998, when Riess and the members of the High-Z Supernova Team and the Supernova Cosmology Project used ground-based telescopes and Hubble to first detect the acceleration of the expansion of space from observations of distant supernovae. Astrophysicists came to the realization that Einstein may have been right after all, that there really was a repulsive form of gravity in space. It soon after was dubbed "dark energy." Over the past eight years, astrophysicists have been trying to uncover two of dark energy's most fundamental properties: its strength and its permanence. The new observations reveal that dark energy was present and obstructing the gravitational pull of the matter in the universe even before it began to win this cosmic "tug of war." Hubble observations of the most distant supernovae known, reported in 2004 by Riess and colleagues, revealed that the early universe was dominated by matter whose gravity was slowing down the universe's expansion rate, like a ball rolling up a slight incline. The observations also confirmed that the expansion rate of the cosmos began speeding up about 5 billion to 6 billion years ago, like a roller coaster zooming down a track. That is when astronomers believe that dark energy's repulsive force overtook gravity's attractive grip. By measuring the universe's relative size over time, astrophysicists have tracked the universe's growth spurts, much as a parent may witness the growth spurts of a child by tracking changes in height on a doorframe. Distant supernovae provide the doorframe markings read by Hubble. "After we subtract the gravity from the known matter in the universe, we can see the dark energy pushing to get out," said Lou Strolger of the University of Western Kentucky, a supernova hunter on the Riess team. Further observations presently under way with Hubble by Riess and his team should continue to offer new clues to the nature of dark energy.